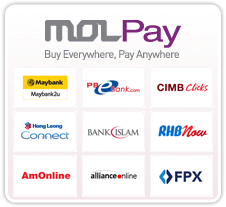 We provide FREE Pos Laju shipping on all orders above RM80 within Malaysia, including Sabah & Sarawak. Tracking numbers are emailed once posted. We post all orders made before 1PM, Monday - Friday on the same day via Pos Laju. If customers do not receive their order within 3 working days, please contact our customer service department to track your order. Q1: What is your return policy? If for any reason you are not completely satisfied with the item purchase, you may return your purchase to us. All return items must be returned in UNWORN, UNWASHED, UNALTERED, UNIRONED condition with ALL TAGS ATTACHED for store credit only. Returns must be posted within THREE (3) days of receiving your order along with the RETURN FORM (printed behind invoice posted). Q3: What should I do when I received a defect item/wrong item/missing item? For all orders with missing, defect or wrong item, email us at wenilla2u@gmail.com with you order number. You may call us at +6012-3453843. We will advise accordingly. Size : Top S : Length : 36inch , Bust : 34inch , Shoulder : 13.5inch , Sleeve : 23inch , Waist ..
Order today Ship today and receive tomorrow by Poslaju !